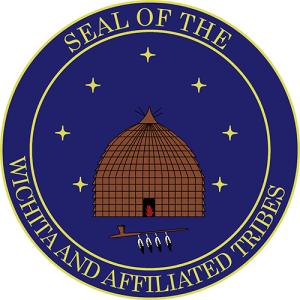 Wichita and Affiliated Tribes are a federally recognized tribe known to historians as the Wichitas, Wacos, Taovayas, Tawakonis, and Kichais people. Their ancestors have lived in the Central and Southern Plains since prehistoric times. The Wichitas reaped abundant harvests from the land by farming and hunting. During the spring, summer, and early fall they lived in grass house villages while the women cultivated nearby gardens. During the late fall and winter, the Wichitas left their villages for extended buffalo hunts. Living in tipis with family members camping near one another, the men tried to bring in enough game to provide meat for later seasons. While European settlements introduced new types of goods to the Wichitas, they also brought highly contagious diseases. At the same time, hostilities increased as eastern tribes were removed to Indian Territory. As such turmoil cast a lengthening shadow over the land, the Wichitas lost many people. In 1820, the once populous Wichitas, Wacos, Tawakonis, Taovayas, and Kichais were estimated at no more than 1400 persons. Truly the “days of darkness” had begun. This trend continued even with the signing of the first American-Wichita treaty at Camp Holmes in 1835. There can be no doubt about the sincerity of the Wichitas who persuaded their Comanche allies to attend and sign this agreement which recognized their right to their traditional homeland. This treaty also contains the first official usage of the name “Wichita” for the Wichita, Waco, and Tawakoni people. After the Texas Republic was established in 1836, the Wichitas were forced to defend their lands against the intrusions of white settlers. It was not until 1855, after Texas joined the United States, that a reservation for the Wichitas was established on the Brazos River. However, continued hostilities from neighboring settlers led to the Wichita removal from Texas to lands on the Washita River. There they joined their northern relatives in what is now west-central Oklahoma. Despite having established a reservation and agency, the Wichita people were not able to remain in this land. In 1863, they were forced by Confederate troops to leave their reservation and flee north to Kansas. While in Kansas from 1863 to 1867, the Wichitas had no land to farm and few friends to help them in their time of trouble. Many people starved. Others suffered from smallpox and cholera epidemics that swept through their villages. Only 822 people returned to Indian Territory in 1867. Once settled on the reservation, government agents worked to destroy Wichita culture. Children were placed in boarding schools where they were forbidden to speak their own language. In 1900 their reservation was once again taken from them, and divided into allotments of 160 acres per person with the remainder declared “surplus lands” and opened to settlement. A resistance led by Tawakoni Jim, tried to prevent the breaking up of their assigned lands to no avail. These allotments brought about the final destruction of the Wichitas’ grass house villages and their communal way of life. Wichita history has been one of endurance and survival despite overwhelming adversity. Although village and communal life was destroyed with the loss of reservation land in 1900 and the grass lodges were replaced by frame houses by the1930’s, the Wichita people have preserved many elements of their culture for the present and future generations. These descendants of the Wichita, Waco, Tawakoni, Taovaya, and Kichai people survive as a group perhaps because of their shared memories of the past as well as common experiences of the present and their faith in the future. Organized as the Wichita and Affiliated Tribes, their headquarters is at Anadarko, Oklahoma, where the tribal park and office buildings are located. Their tribal jurisdiction includes Blaine, Caddo, Canadian, Custer, Grady, and Washita counties in Oklahoma. The tribal government, established under the Indian Reorganization Act of 1934 and the Oklahoma Welfare Act of 1935, consists of a President and Executive Committee who are elected to four-year terms by the enrolled tribal members. The Wichitas have joined also with the Caddo and Delaware tribes to form WCD Enterprises, an organization that promotes business development. The Wichita and Affiliated Tribes are a federally recognized tribe known to historians as the Wichitas, Wacos, Taovayas, Tawakonis, and Kichais people. Their ancestors have lived in the Central and Southern Plains since prehistoric times. The Wichitas reaped abundant harvests from the land by farming and hunting. During the spring, summer, and early fall they lived in grass house villages while the women cultivated nearby gardens. During the late fall and winter, the Wichitas left their villages for extended buffalo hunts. Living in tipis with family members camping near one another, the men tried to bring in enough game to provide meat for later seasons. Wichita is closely related historically to Pawnee, Arikara, and Kitsai. That means that some time in the past– probably on the order of 800 to 1200 years ago– the ancestors of these four tribe lived together and spoke one language, which then developed differently among the different groups after they were no longer living together. Some time even earlier than that, the ancestors of these groups and those of the Caddo also formed one group. Linguists have given the name Caddoan Family to this set of languages, but there is no sense in which any of the modern languages is older than any other– they all go back to a single group, much as all the branches of a tree go back to the trunk, with no main branch being the source of any other branch, but rather all deriving from the trunk.